Cabinet Transformations™ by the Painter Sisters is an exciting service that will give your tired looking, outdated or just plain boring cabinets new life. We offer a variety of styles that rival factory finishes at a fraction of the cost of replacement or refacing. The results are fantastic and the cabinets are incredibly durable. No stains, no chips, easy to clean and the change to your home is dramatic. The beauty of our process is that we customize our finishes to meet your individual needs. 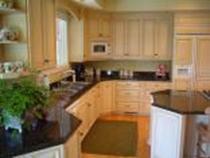 You really need to call us for an estimate if you are considering replacement or refacing your cabinets. If you already have an estimate for replacement or refacing you know the tremendously high costs involved! Cabinet Transformations™ by the Painter Sisters delivers beautiful results at a fraction of the cost! This process is not simply a paint job. It is a multistep procedure using newly developed preparation and finishing products that are not available at retail locations. The products we use are of the highest quality and the process has been developed, in conjunction with the product manufacturer, to ensure only the finest results. We antiqued the cabinets and gave the walls a soft faux finish. The results are dramatic and the homeowners loved the transformation. This is a home in The Preserve. 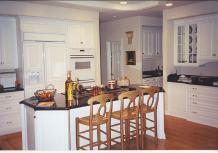 The cabinets were in good shape but were very white and the homeowner wanted to warm the space.